B0259. 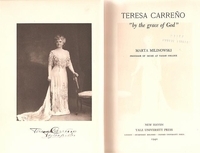 Teresa Carreño, “by the grace of God”. Marta Milinowski. New Haven, Yale University Press, 1940. 410pp. Index; Bibliography; Chronology; Photos; DJ. 1st Edition; red cloth over boards with gilt lettering to spine. Front endpaper inscribed & autographed by the Author. DJ is sl.waterstained & has few wee tears. Exceedingly rare!